received "Outstanding Organization Award for Drug Prevention and Correction in the Workplace"
TCY Rap Contest under "Philosophy of Sufficiency Economy"
641 Tsuchiya with Amata Corporation, other companies and Industrial Estate Authority of Thailand (IEAT) joined CSR activity by offer food to monk at Wat Map Sam Kliao every monk’s day (This month is on 5, 13, 20, 27). 640 Tsuchiya provided “Creating happiness in workplace” to our employees with purpose to giving the knowledge of how to easily take care of their mental health by Mrs.Wanwilai Pootrakool, Director Mental Health Center 6, Chonburi and staffs at TCY on 29 March 2019. 639 Tsuchiya with Amata Corporation, other companies and Industrial Estate Authority of Thailand (IEAT) joined Plant trees project for the celebration of Her Royal Highness Princess Maha Chakri Sirindhorn's 64th Birthday Anniversary at Amata City Chonburi on 28 March 2019. 638 There were 2booth from S26 which devided into 2 different information group on 27 March 2019. 637 In Amata friendship sport No.18, Tsuchiya participated in football competition in Chonburi and our team draw the first game with Zeniya company by score 0-0 on 17 March 2019. 636 There was a group of HR section from 30 different companies visited our factory in order to acknowledge about TO BE NUMBER ONE project and the drug prevention system, Personnel development system and How to be well known company about the good Labor Relationship Management on 15 March 2019. 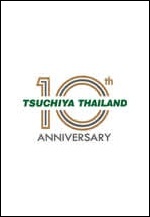 635 Tsuchiya donated money to Chonburi Labour Department to organize the charity activity of the Thai Red Cross in order to raise fund for helping poor and disabled people in Chonburi Province on 14 March 2019. 634 Tsuchiya provided the project of PAP Smear screening test for our employees to realize and prevent the womb cancer for women employees by Somdejprabaromratchathewi na Sriracha hospital on 13 March 2019. 633 Ms.Weena attended in the MOU ceremony between Amata City Chonburi and Government Savings Bank to help everyone in Amata community to relief the informal debt on 13 March 2019. 632 Tsuchiya had got the invitation to join The International Woman's Day 2019 at Miracle Grand Convention Hotel, Bangkok on 8 March 2019. 642 Tsuchiya with Amata Corporation, other companies and Industrial Estate Authority of Thailand (IEAT) joined CSR activity by offer food to monk at Wat Map Sam Kliao every monk’s day (This month is on 5, 13, 20, 27). 641 Tsuchiya provided “Creating happiness in workplace” to our employees with purpose to giving the knowledge of how to easily take care of their mental health by Mrs.Wanwilai Pootrakool, Director Mental Health Center 6, Chonburi and staffs at TCY. 640 Tsuchiya with Amata Corporation, other companies and Industrial Estate Authority of Thailand (IEAT) joined Plant trees project for the celebration of Her Royal Highness Princess Maha Chakri Sirindhorn's 64th Birthday Anniversary at Amata City Chonburi. 639 There were 2booth from S26 which devided into 2 different information group. 638 In Amata friendship sport No.18, Tsuchiya participated in football competition in Chonburi and our team draw the first game with Zeniya company by score 0-0. 637 There was a group of HR section from 30 different companies visited our factory in order to acknowledge about TO BE NUMBER ONE project and the drug prevention system, Personnel development system and How to be well known company about the good Labor Relationship Management. 636 Tsuchiya donated money to Chonburi Labour Department to organize the charity activity of the Thai Red Cross in order to raise fund for helping poor and disabled people in Chonburi Province. 635 Tsuchiya provided the project of PAP Smear screening test for our employees to realize and prevent the womb cancer for women employees by Somdejprabaromratchathewi na Sriracha hospital. 634 Ms.Weena attended in the MOU ceremony between Amata City Chonburi and Government Savings Bank to help everyone in Amata community to relief the informal debt. 633 Tsuchiya had got the invitation to join The International Woman's Day 2019 at Miracle Grand Convention Hotel, Bangkok.